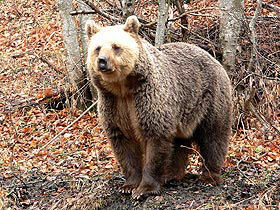 Bulgaria is one of the best places for watching brown bears in Europe with a population of some 600-800 bears. This short holiday offers you the chance to see bears in Bulgaria. Bear sightings are not guaranteed though they reckon you have a 90% chance of observing wild brown bears during the best periods (full moon periods are strongly recommended). An exciting tour dedicated to observing wild brown bears in their hunting territories, without fences, without human interference in the heart of the most unspoilt part of the Rodopi Mountains. The guides use hides that are specially arranged for watching brown bears. You will spend a few hours after sunset and before sunrise or a whole night waiting for the bear to appear. If lucky we may enjoy a mother with cubs or solitary males and other nocturnal wildlife too. The bears are usually seen from 30-50 meters.